What is a Dog Pool? 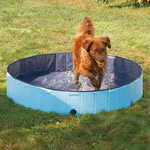 Guardian Gear manufactures affordable dog pools for quick and easy use. The Guardian Gear Dog Pool are made of extra-tough PVC that folds down completely for transport and storage. Guardian Gear Dog Pools. A refreshing dog pool that pets can use to cool off in on hot days. 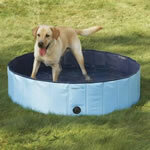 Our Guardian Gear Dog Pools are made of extra-tough PVC that folds down completely for transport and storage. Give dogs cooling relief from the heat. 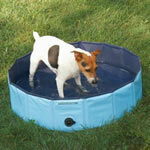 Our dog pools are portable, easy to fill and empty, and made of extra tough PVC for lasting use. Perfect for a refreshing dip in backyards, or on decks or patios. Pools fold down completely, making them easy to pack for summer vacations and easy to store during the winter months. Large Pool measures 12"H x 47"D. Material: 100% PVC. * When you click on the "More Info" button you can read the about Guardian Gear equipment. © 2019 Dog Pools .com All Rights Reserved.